Do you live in the Arrowhead area of Arizona and need a licensed foam roofing contractor? 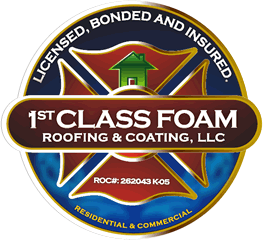 1st Class Foam Roofing and Coating, LLC has over 17 years of experience. We are licensed, bonded and insured and can help you with your Phoenix foam roofing system installation, repair or re-coating. Our team’s emphasis on customer satisfaction and high quality workmanship means you will not be disappointed in our work. We can provide you a with a lifetime foam roof. A foam roof can be installed on both a commercial building or a residential home. It is the longest lasting roofing system and out-lives standard roofing structures such as shingle or tiled systems. Contact us today to determine if a foam roof is right for your Arrowhead business or home. A Foam rooftop is an economical investment because it is affordable, low maintenance and also lasts even longer than the building itself. As long as your foam roofing system is properly applied and you follow up on maintenance, your foam roof can last over 50 years. A German Professor by the name of Dr. Otto Bayer developed polyurethane foam in 1937 as a replacement for rubber. In 1953, Walter Baughman created a machine called the Blendometer which mixed chemicals to create a plastic expanding foam. It was applied as a liquid and would expand into a thick foam which hardened after curing. In 1957 the first foamed roof was used on a rail car. By the 1950’s and 1960’s, foam and coatings were still being experimented. In 1963 a spray machine was invented by Fred Gusmer and Fred Werner. Other inventions of spray foam machines were created which created a huge boom in roofing and insulation markets using this incredible new foam material. By the late 1960’s and early 1970’s foam roofing was being used instead of tar and gravel. Over the years, the foam roofing systems have improved and are still a very popular and economical option that last a lifetime. Consider a foam roofing system for your Arrowhead, Arizona home. We will love to discuss the many benefits with you. Is a Foam Roof right for my home or business? Call us today to find out! We can consult with you on your Arrowhead commercial or residential business needs to determine if you would benefit from a foam roofing system.